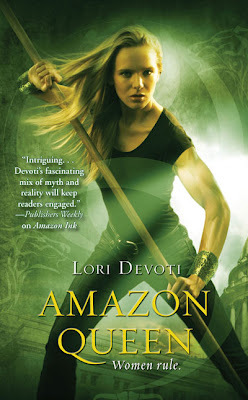 Juno editor Paula Guran posted the cover for Amazon Queen by Lori Devoti over at the Juno Books blog. This is the follow-up to Amazon Ink (May 2--9). The book hits the shelves April 27, 2010. The slogan appears to be "Women Rule". You won't get any argument from me. Zery Kostovska is a reigning Amazon queen. It was an easy enough position until her old friend who’d turned her back on the tribe, Melanippe (Mel) Sarka, discovered the Amazons weren’t alone—that the abandoned sons of the Amazons still lived and had the same powers as their female counterparts. Now everything the Amazons have believed for millennia is being questioned. Some even want to make themselves known to normal humans. As if this isn’t enough to deal with, someone seems to be stalking Zery, causing little problems that quickly escalate to the point that flying under the human radar is almost impossible. The police are at her door and the Amazons are rattled. Zery is forced to go deeper into the human world than she ever has before, teaming up with a man who has his own problems with the law. Soon she has no idea who she can trust. Is it as simple as one of her own deciding to take advantage of the disarray in the group to take power…or is it something far more sinister? Despite knowing tribal rules better than most, she finds herself confiding in a man, of all things. Will this be her salvation or just make her a new even more dangerous set of enemies when the Amazons find out? Sounds neat and I just love the cover! Karen Amazon Ink unfortunately is still in my TBR stack. Have you ever read any or heard of The Golden Amazon by John Russell Fearn (I believe he was an incredibly prolific UK pulp SF writer). I actually have an old HQN title and bunch of serialized episodes.